#1 Stun Gun vs Taser : Is a Stun Gun a Taser? One of the biggest misconceptions about self-defense weapons is the myth that tasers and stun guns are the same. While tasers and stun guns are definitely similar, they aren’t exactly the same. That being said, continue reading to learn about the differences of tasers and stun guns! Although tasers and stun guns aren’t exactly the same, many tasers have a stun gun function. Therefore, some tasers are stun guns.It should also be noted that there is a popular taser manufacturer named TASER, which offers tasers with stun gun functions. So, where does the name TASER come from? Well, TASER derives from Thomas A. Swift, who was a popular character in novels that had an electric rifle. Hence, TASER represents Thomas A. Swift’s Electric Rifle. One of the main differences between tasers and stun guns is how the weapons shoot. On one hand, tasers can be shot from up to 20 feet away. When a taser is fired, pairs of electrode darts with wire attachments shoot out and attach themselves to their target. On the other hand, stun guns do not have the ability to shoot a target from a distance. Instead, you are forced to get as close as possible to the target. Once you are in close proximity to your target, press your stun gun against their body. This will cause pairs of electrodes to transmit a current. As you can tell, shooting differences play a big role in comparing tasers and stun guns. 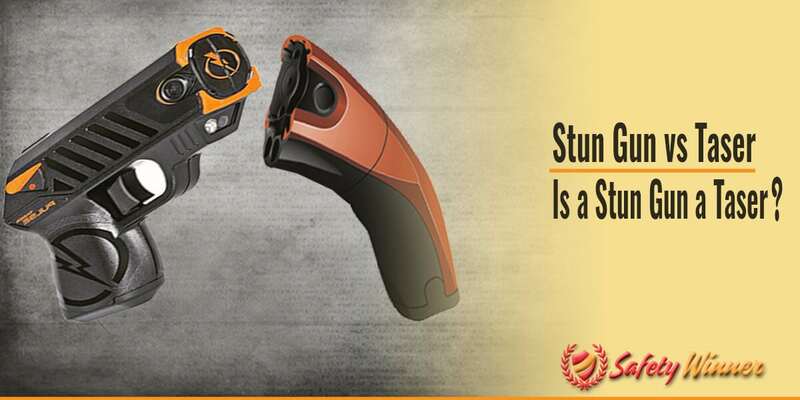 Stun guns can be helpful if you’re restrained by your target. But, stun guns can also be intimidating because you have to run up to your target to knock them down if they aren’t already next to you. Luckily, you can fire a taser from a short distance. And if you are restrained by your target, you will most likely be able to use a stun gun feature that many modern tasers have. Since stun guns require you to get as close as possible to your target, stun guns are typically small and discreet. Although a typical stun gun comes in a box shape, many modern stun guns look like every day objects, such as lipstick and an iPhone. On the other hand, tasers require more power. This means they require more technology and space to work accurately, which is why most tasers look like typical guns. Overall, appearance is definitely something you should think about when considering purchasing a stun gun or taser. After all, your target would most likely be able to identify that you have a taser, but wouldn’t be able to recognize a stun gun. This could be potentially extremely beneficial because tasers tend to look like regular guns. In other words, your target might think you have a real gun, which would hopefully scare them off. While it’s okay to like additional features, it should be noted that stun guns typically have additional features but tasers do not. This stems from the nature of each of the self-defense weapons. Take a second and think about it. On one hand, a stun gun is generally smaller and less powerful than a taser. Also, a stun gun requires you to fire it directly on your target’s body. Therefore, it’s almost necessary that you have additional features. A common additional feature you can find on a taser is a LED flashlight. On the other hand, a taser is extremely powerful and easy to use even from a distance. Therefore, you don’t really need to have any additional features. And let’s face it: a LED flashlight on a taser would just be excessive and ridiculous. Although tasers don’t usually have additional features, many modern day tasers are equipped with laser technology, which tracks the line of your aim from the taser to the target, as well as a stun gun feature. Since stun guns only really have two prongs that do all of the damage, you typically don’t have to clean or maintain your stun gun. Generally speaking, stun guns are also pretty budget friendly. So, whenever your stun gun starts to fail you, simply purchase a new one! On the other hand, tasers generally require a little bit of maintenance. After all, tasers are a type of gun. So, expect to clean and maintain it regularly to make sure that everything is working properly. It’s also budget friendly if you maintain your taser because you won’t have to shell out a ton of money to replace it. There are a ton of misconceptions surrounding registration and regulations in regards to stun guns and tasers. Let’s start with the basic notion that stun guns and tasers are not considered as firearms. I know this is surprising, especially that tasers look like guns, which are considered as firearms. But, it’s important you don’t consider appearance in this case. Another common misconception about stun guns and tasers is that they are illegal to own in every state. Although you can own a stun gun or taser is most states in the United States, you should check your state’s laws and regulations prior to purchasing a stun gun or taser. It’s also important to keep in mind that tasers generally have stricter regulations than stun guns. For example, be prepared to get a background check and register your taser when you purchase it. While you have to do this when you purchase a taser, you don’t have to do it if you purchase a stun gun. In fact, you can purchase a stun gun virtually anywhere at any time. This difference is largely due to the fact tasers can do more harm than stun guns. After all, it’s important that you know how to safely and responsibly use your taser in the event you ever need it to protect yourself. As you can tell, although stun guns and tasers are similar in a sense, they are very different in nature. Ultimately, it’s up to you to decide which self-defense item is more suitable for your needs and budget. Hopefully this article helped you understand which self-defense item appeals to you more.